OUT - We liked this Yo-Yo before it was cool! Once Upon a Tree is a small company founded by by Paul Cerny, based out of Houston Texas. He creates some amazing hand-crafted wooden skill toys (The VooDama) and beautiful fixed axle yo-yos. And one of his latest creations is the Hipster! Whether you love them, tolerate them, or just don't get it - Hipsters aren't going anywhere, so it's time to embrace the Hipster in you! 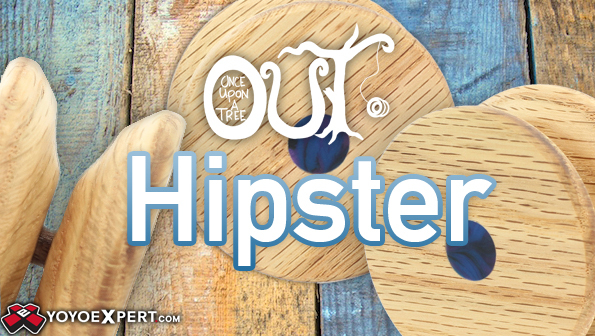 Once Upon a Tree crafted the Hipster with a lower wall than your average fixed axle yo-yo for added maneuverability and a beautiful stepped gap that provides a nice wide catch zone. The Hipster plays on the faster side and with a lighter weight and is just a joy to throw! Available in some great color combos with a Walnut axle, you're not going to want to put this hip new yo-yo down!